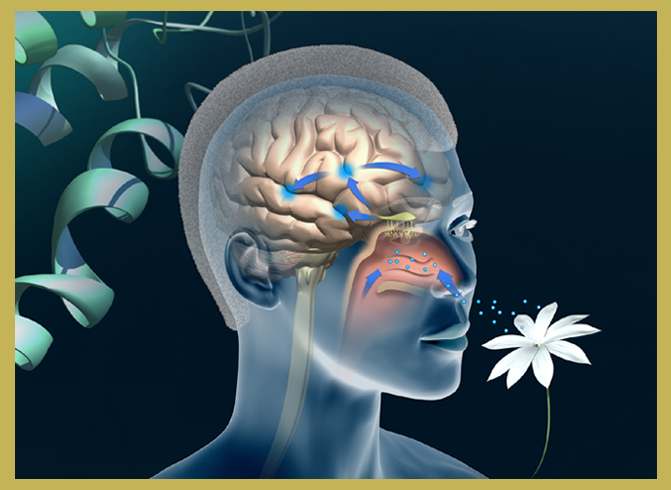 Olfaction is the most powerful of all human senses. That's why Aromatherapy can be so effective. By blending essential oils in perfect balance, we have the potential to completely change our emotional state and attract what we want most in life. Deep within our brain lies a small, almond shaped group of neurons called the Amygdala. Here, emotions and emotional memory are processed. Incredibly, the only way to unlock these specially stored emotions is through our olfactory sense. Essential oils provide a powerful shortcut, helping our body and mind break through negative emotional patterns at their source. Simply by breathing them in, they trigger the Amygdala within our brain, unlocking emotional trauma, reinforcing positive memories and allowing us to release, relax, and uplift. Like attracts like. When our emotions are balanced, we attract the people, places, experiences, and intuitions that guide us to our highest good. Slow down, take a deep breath and find instant peace with this organic blend of calming essential oils. In times of sadness, breathe joy back into your life with this blend of uplifting essential oils. When frustrated and stuck, find focus and drive with this blend of inspiring essential oils. dōTERRA essential oils are subjected to the most rigorous testing in the industry. This allows our Certified Pure Therapeutic Grade oils to reach a level of potency, purity and consistency you won’t find anywhere else. Try it! If you aren't satisfied, you can return any productwithin 30 days for a full refund. Our process not only produces the highest quality essential oils, it also helps lift global communities out of poverty and into sustainability. **Possible skin sensitivity. Keep out of reach of children. If you are pregnant, nursing, or under a doctor’s care, consult your physician. Avoid contact with eyes, inner ears, and sensitive areas.